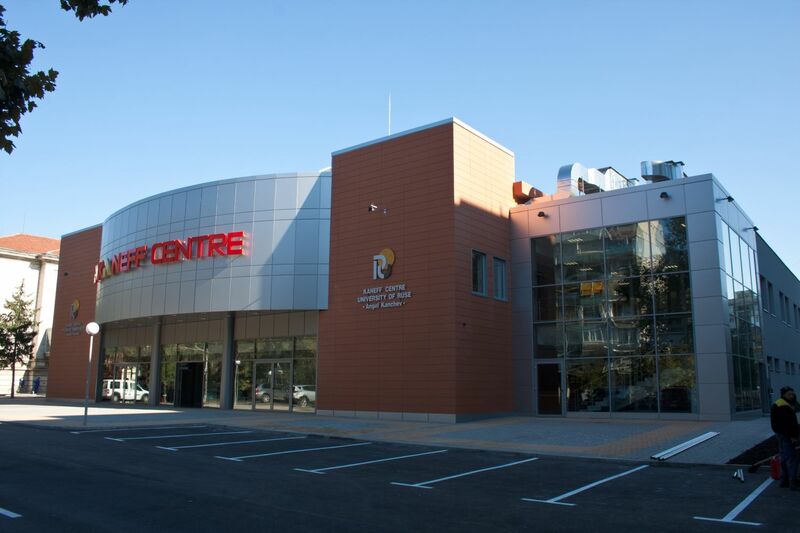 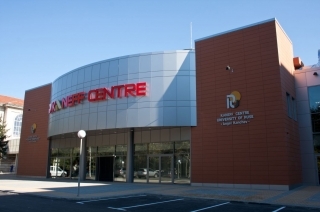 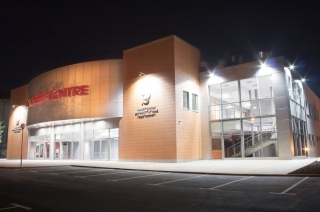 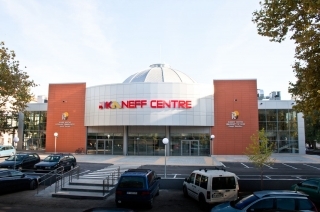 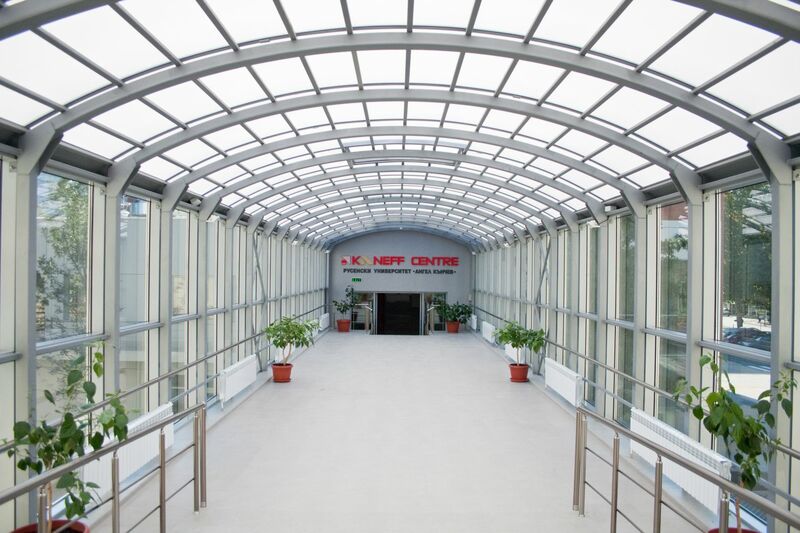 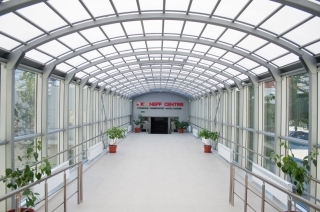 The Complex "KANEFF CENTRE" has been realized under the initiative of the management board of “Angel Kanchev” University of Ruse. 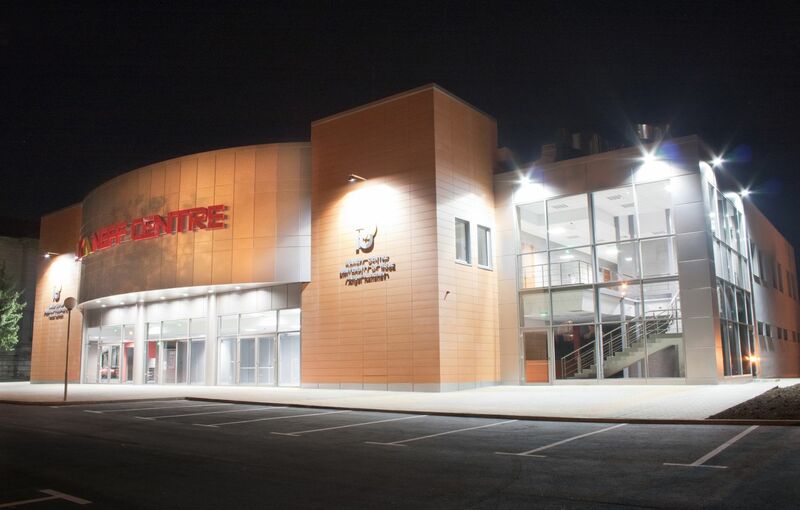 Two versions of feasibility study for construction of Expo Centre with multifunctional hall, 2 conference halls, restaurant and offices were prepared in 2012. After the visit of Mr. Ignat Kaneff in September 2012, the project grew into KANEFF CENTRE RUSE UNIVERSITY ‘’ANGEL KANCHEV”. 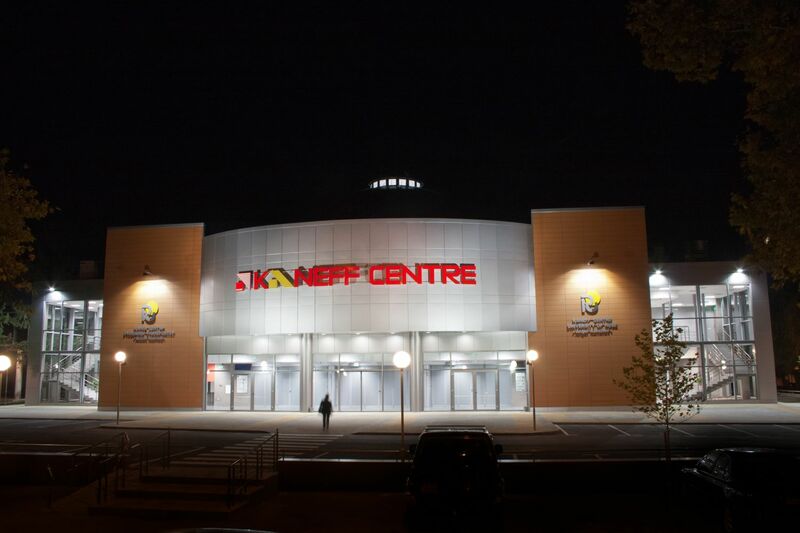 It was constructed with funds donated by Mr. Ignat Kaneff and additional financing by University of Ruse. The complex is in full correspondence with the needs of the fast development of the scientific and economic potential of Republic of Bulgaria. "KANEFF CENTRE" / first stage / is built on the territory of “Angel Kanchev” University of Ruse, as a part of the University Campus, with main entrance facing “Studentska” Street. 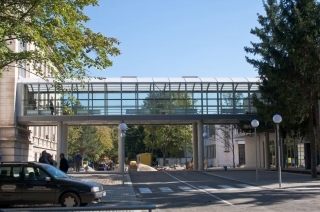 It is built on two levels, with a partial basement (built up area: 3,472 m2) and a connection to the Central University Building. 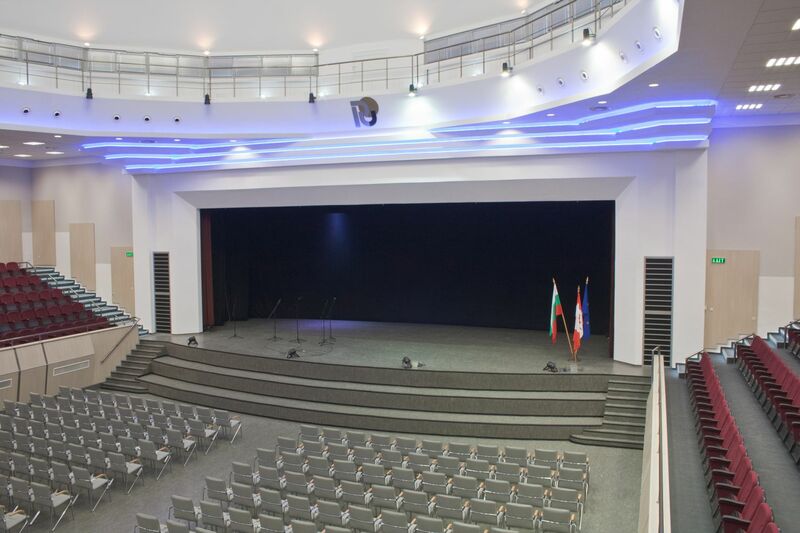 The two-storey complex is equipped with a multifunctional hall, with capacity 790 seats, 482 of which are located in the stands over the entrance of the hall, and in the two boxes (left and right) amphitheatrically, the remaining 308 seats are located on the flat floor, so that the hall can be used for exhibitions and presentations. 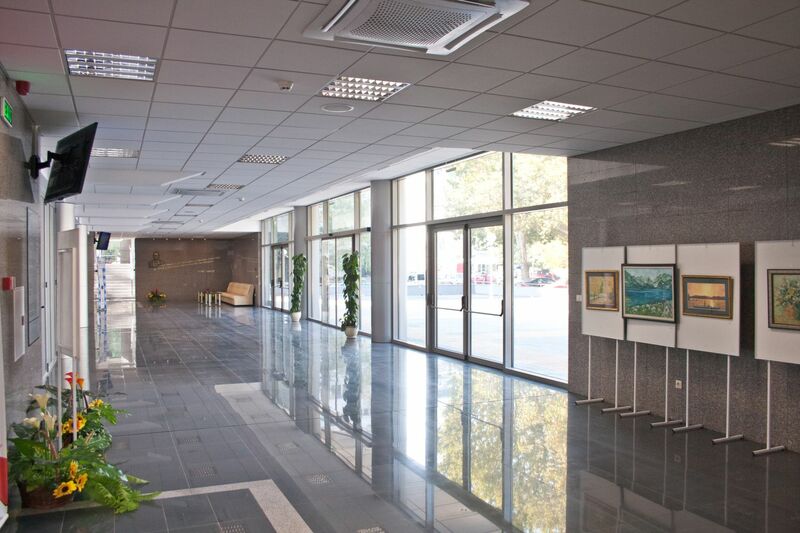 A maximum opening of the doors between the lobby and the hall is provided for the purposes of their integration. 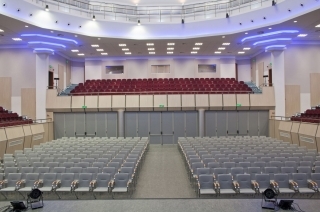 A metal construction dome is built above the hall with side lighting and service platforms. 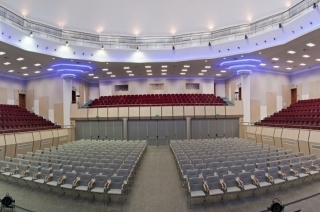 The stage of the hall is with area of ​​about 120m2, with advance-stage and small service areas - left, right and back. 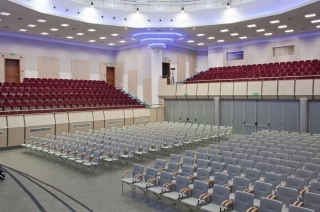 The stage is equipped with optimal upper stage mechanization and mobile screen. 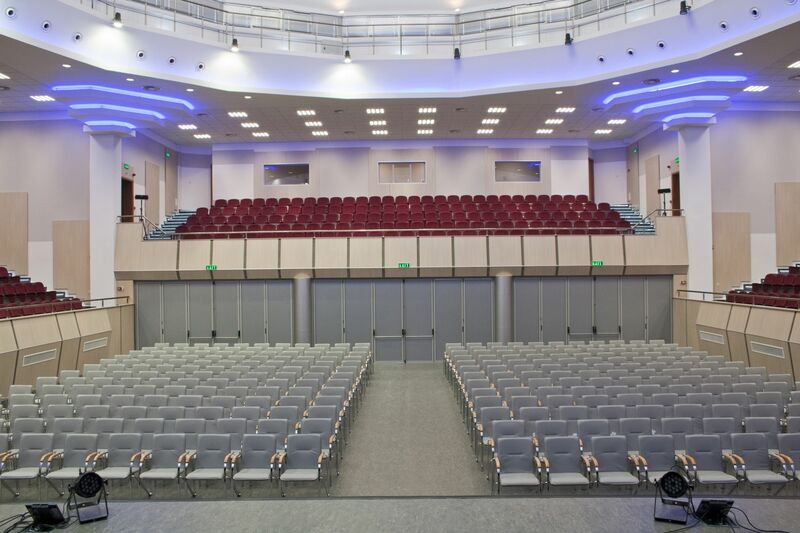 Stage lighting - with front and rear lighting bridges and effective lighting from the bottom of the hall are provided. The general management of the systems is localized in technical rooms above the entrance of the hall. 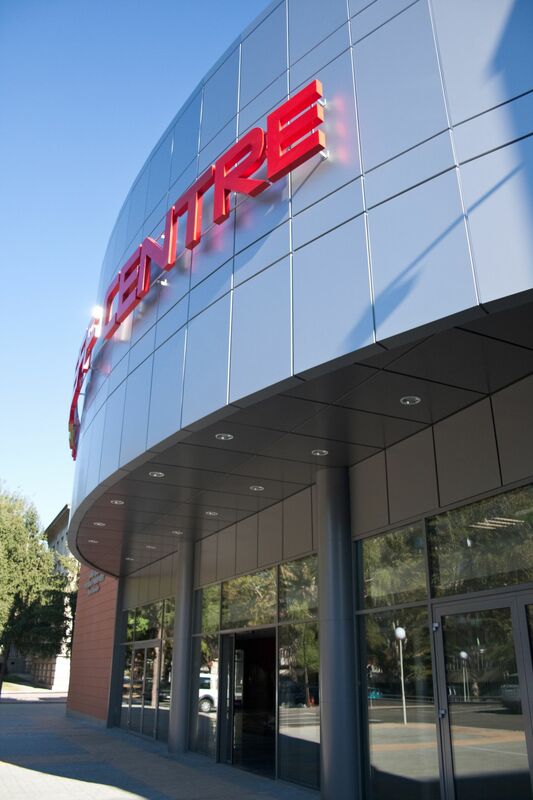 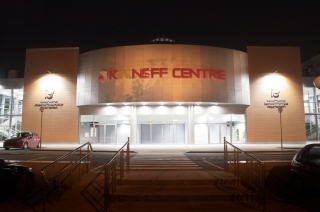 Free areas in the lobby of "KANEFF CENTRE" are provided for exhibitions and presentations. There is also a small bar for coffee and drinks, a cloakroom and a restaurant with 120 seats. 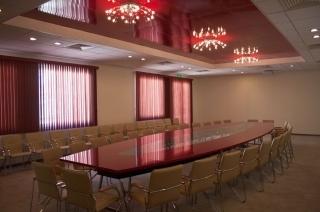 On the second floor of the complex there is a meeting hall with 70 seats, a conference hall with 100 seats, a press conferene hall and service offices. 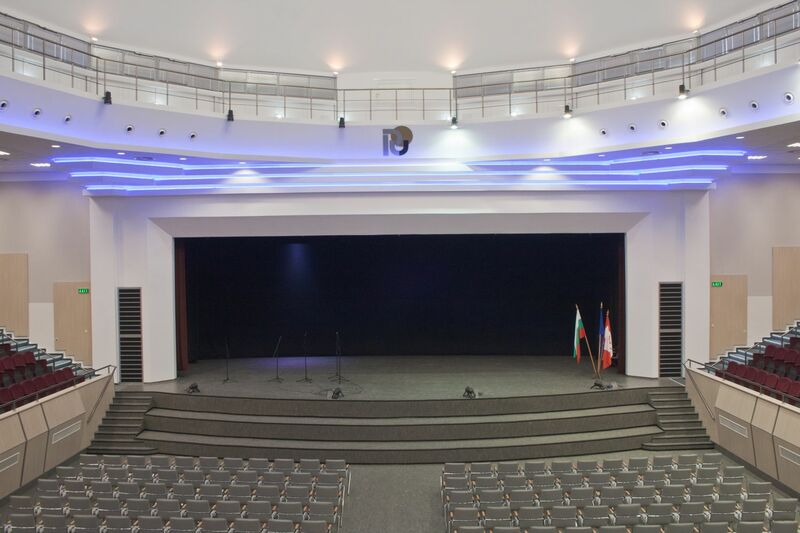 They are equipped with modern systems for lighting, sounding, presentation and simultaneous translation. 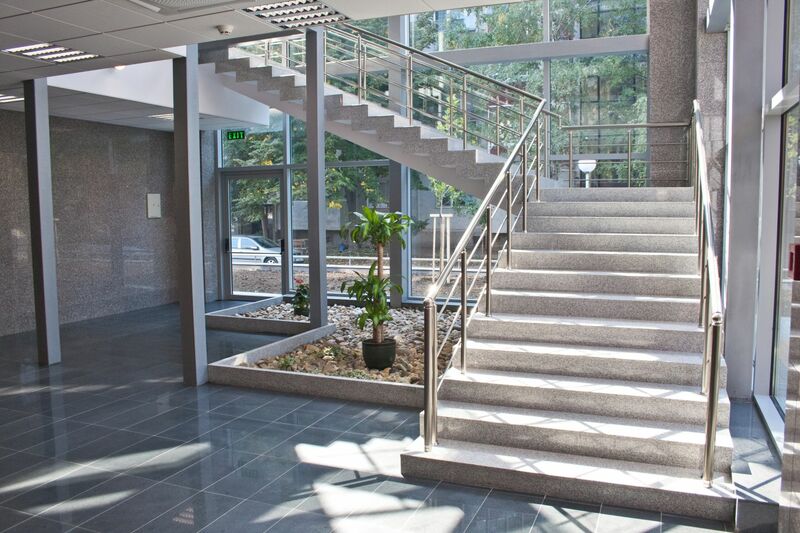 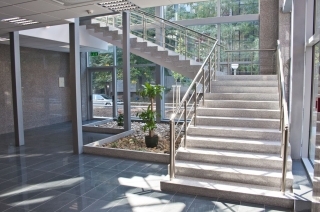 The access to the second floor is provided by two stairways and panoramic elevators on both sides of the lobby. 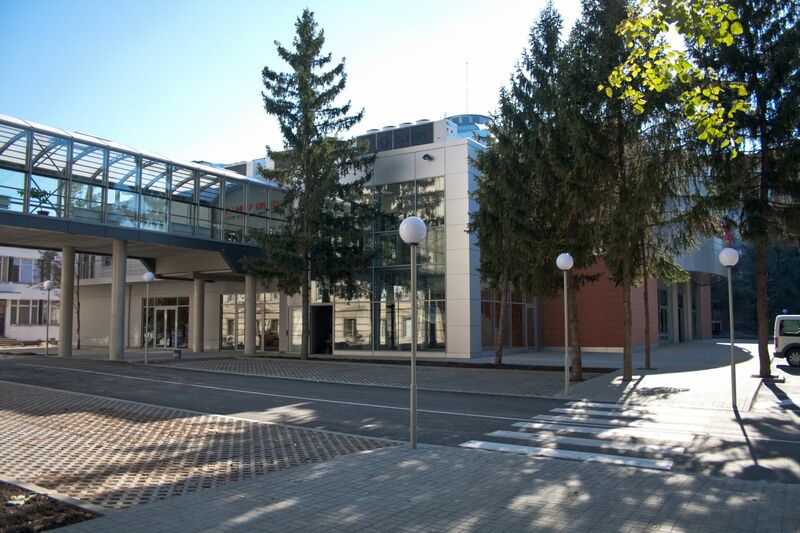 The design of the exterior of the building is analogical to the newly built Corpus 2. 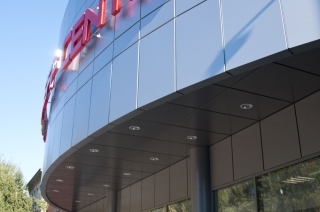 Façades with ceramics and aluminum are mainly used /Creaton, Etalbond/, external plastering, AL window frames. 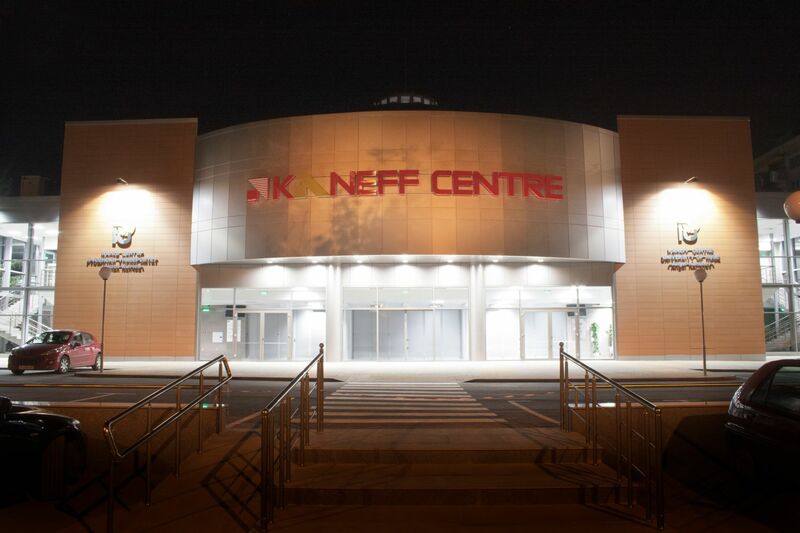 Effective façade lighting is implemented. 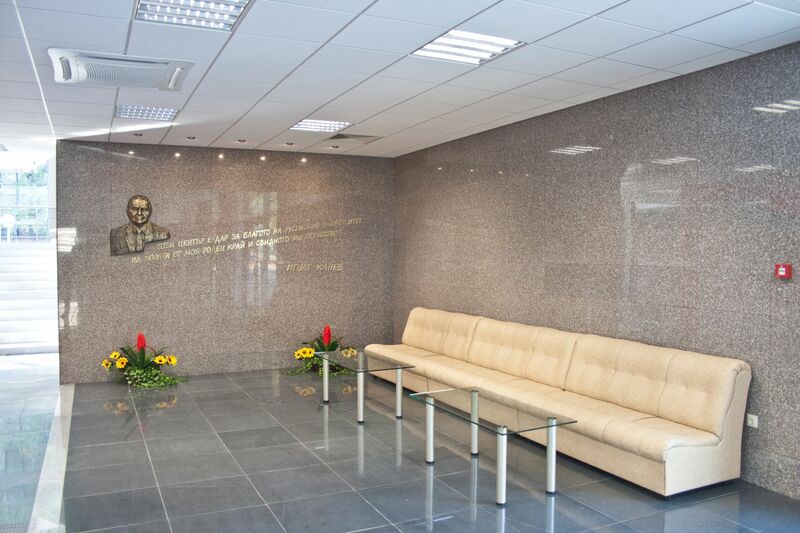 For the interior are used 20mm polished granite slabs and synthetic flooring for the floors, for the walls and ceilings - polished granite 10mm, etalbond, wall linings and suspended ceilings "Armstrong" system, also for acoustic sounding. 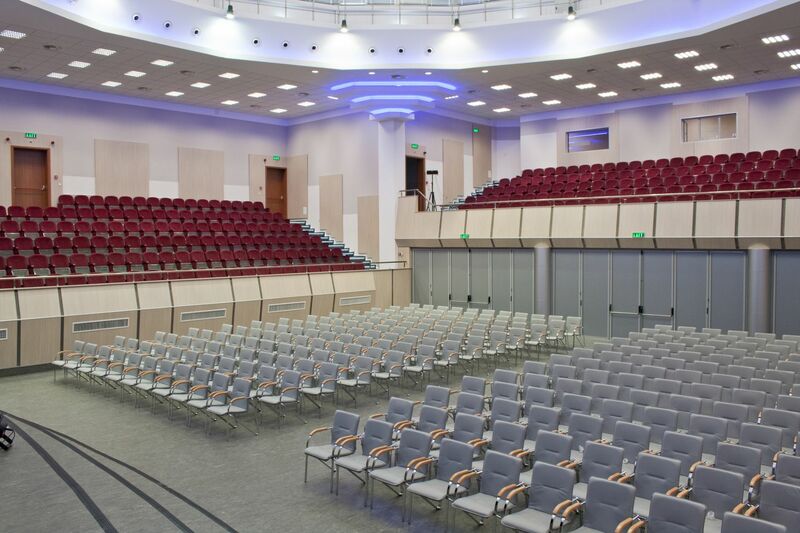 The hall is equipped with falling seat chairs for the amphitheaters and moving metal chairs for Sector A. Designed as a multifunctional cultural center, the complex houses university as well as city, national and international forums. 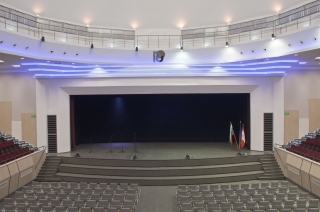 In the building are organized seminars, conferences, symposia, congresses, celebrations and ceremonies, work and student expos, competitions, exhibitions, fairs, festivals, stage performances and concerts. The areas around the new building are implemented with new coverings, landscaping and alley lighting. Parking zone and pedestrian access to the Central University Corpus are provided. 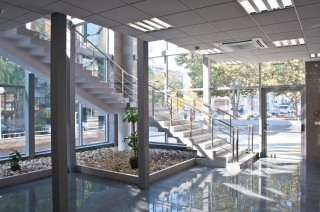 Construction of Blocks G and G1 /business centre and hostel/, consisting of 4 floors and a basement, is envisaged as a next stage of the project. 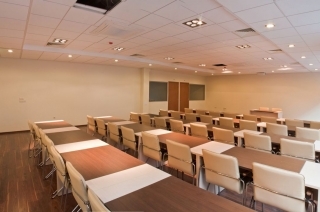 They will house offices, conference halls, service rooms, hotel studios, cafes and parking.